Lake View Cemetery, Cleveland, Ohio, U.S.
Elizabeth, Alice, Alta, Edith, and John Jr.
John Davison Rockefeller (July 8, 1839 - May 23, 1937) was an American capitalist and philanthropist. He was born in Richford, New York, the second of the six children to William Avery Rockefeller (November 13, 1810 - May 11, 1906) and his wife Eliza Davison (September 12, 1813 - March 28, 1889). 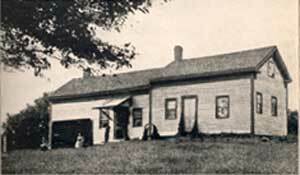 In 1853 his family moved to Strongsville, Ohio. After 1857 he lived in Cleveland, Ohio, where he had begun to work as a book-keeper in 1855. In 1858 he went into the produce commission business. His firm, Clark & Rockefeller, invested in an oil refinery in 1862, and in 1865 Rockefeller sold out his share to his partner Clark, paid $72,500 for a larger share in another refinery, and formed the partnership of Rockefeller & Andrews. At about the same time Rockefeller's brother, William, started another refinery. In 1867 Rockefeller & Andrews took over this business also, and Henry M. Flagler joined the partnership. In 1870 the two Rockefellers, Flagler, Andrews and a refiner named Stephen V. Harkness formed the Standard Oil Company, with John D. Rockefeller as president. Standard Oil gradually gained virtual control of oil production in America. Its growth increased further in 1882, when separate companies were organized in each state. Standard Oil's economies of scale lowered the cost of oil based products so that almost everyone could afford them. 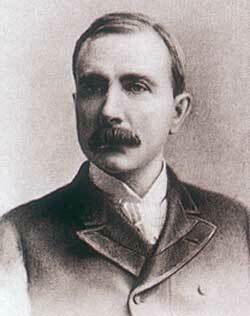 Rockefeller himself retired from active business in 1895. At one time he had large iron interests, including mines and ore-carrying ships, on Lake Superior. He sold those to U.S. Steel. By 1901, he was worth about $900 million and is believed to have been the world's richest man at the time. His net worth when adjusted for inflation would put him in the top twenty modern day billionaires; however, when adjusted for the size of the United States economy in his day, his net worth would dwarf that of any of today's billionaires. In 2001, it was estimated that in contemporary money Rockefeller would be worth $200 billion. On May 15, 1911, the Supreme Court of the United States held that Standard Oil was a monopoly and ordered it to be broken up, resulting in the creation of approximately 37 new companies. In private life, Rockefeller was a member of the Baptist church, and late in life became a philanthropist. He founded the University of Chicago in 1890, the Rockefeller Institute for Medical Research (now Rockefeller University) in New York City in 1901, the General Education Board in 1902, the Rockefeller Foundation in 1913, and the Laura Spelman Rockefeller Memorial in 1918, as well as giving large gifts to other institutions. His gift of $5 million dollars helped found the Great Smoky Mountains National Park. Rockefeller married Laura C. Spelman (1839-1915), a teacher, on September 8, 1864 in Cleveland. The couple had five children, four daughters and a son. The youngest of the five children was John D. Rockefeller, Jr. (1874-1960), who inherited much of Rockefeller's fortune. Rockefeller's grandson, Nelson Rockefeller, was Vice President of the United States under Gerald Ford and another grandson Winthrop Rockefeller served as Governor of Arkansas. His great-grandson Jay Rockefeller (John D. Rockefeller IV) is currently a member of the U.S. Senate. On March 3, 1910 Rockefeller announced his retirement from managing his businesses so that he could devote full time to being a philanthropist. In his 50s Rockefeller suffered from moderate depression and digestive troubles; during a stressful period in the 1890s he developed alopecia, the loss of some or all body hair. By 1901 he began wearing toupées. His hair never grew back, but other health complaints subsided as he lightened his workload. Rockefeller died of arteriosclerosis on May 23, 1937, less than two months shy of his 98th birthday, at "The Casements", his home in Ormond Beach, Florida. 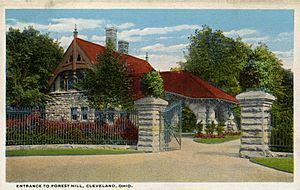 He was buried in Lake View Cemetery in Cleveland. At the time of his death, his wealth was estimated at more than US$5 billion. I was early taught to work as well as play, My life has been one long, happy holiday; Full of work and full of play— I dropped the worry on the way— And God was good to me everyday. John D. Rockerduck, a Walt Disney character who is popular in Europe, is named after him. 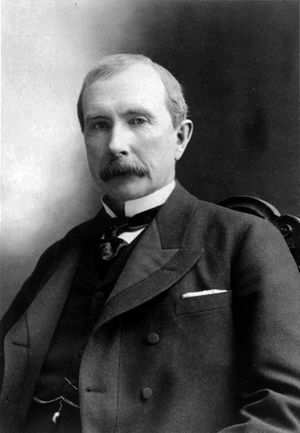 John D. Rockefeller Facts for Kids. Kiddle Encyclopedia.